What Could Be Causing Your Parent’s Dizziness? According to a study published in the medical journal Aging and Disease, complaints of dizziness are extremely common in older adults. Up to 30 percent of seniors report feeling dizzy at times. Not only is dizziness unpleasant, but it can also put older adults at risk for falling. If your aging relative has been having problems with balance and dizziness, it could be caused by one of several things. People use the word “dizzy” to describe a variety of feelings. They may mean that they feel faint or weak. Or, they may mean that they don’t feel steady on their feet. Dizziness is also used to describe vertigo, the feeling that the room is spinning or moving around them. Sometimes the feelings of dizziness get worse upon standing or walking. They may also get worse when the older adult moves their head. Sometimes people who are dizzy also feel nauseated. The Mayo Clinic says that dizziness is usually not a symptom of anything life-threatening, but it can seriously affect quality of life. Vertigo: Vertigo is when a person feels like they are still, but their surroundings are moving. The most common kind of vertigo is called benign paroxysmal positional vertigo (BPPV). It happens when a small bit of calcium in the inner ear breaks off and floats to a place it doesn’t belong. This causes the ear to send erroneous signals to the brain. Infection: An ear infection that causes inflammation in the inner ear can also cause dizziness. When dizziness is caused by an infection, it usually happens suddenly and may be accompanied by ringing in the ears. Meniere’s Disease: When an older adult has Meniere’s disease, too much fluid collects in the inner ear. It causes sudden dizziness that can last for hours. Your aging relative might also complain of feeling like their ear is plugged or ringing. They may also have difficulty hearing. Blood Pressure Fluctuations: When blood pressure suddenly dips, it can cause the person to feel lightheaded or faint. This usually happens when the older adult stands or sits up too fast. If your older family member has dizzy spells, home care can help to prevent falls. Home care providers can assist the senior to get up from a chair or bed, holding their arm until they feel steady. If the doctor has prescribed medicine, such as an antibiotic for an infection, the home care provider can remind them to take it. 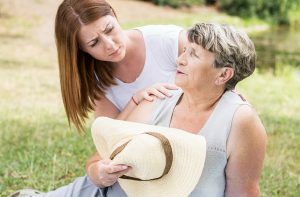 Home care providers can also watch for more serious symptoms that sometimes occur with dizziness, such as a sudden or severe headache or changes in speech, which may indicate the need for emergency medical assistance. If you or an aging loved one are considering home care in Marlboro Township, NJ, please contact the caring staff at Lares Home Care 888-492-3538 or 732-566-1112.